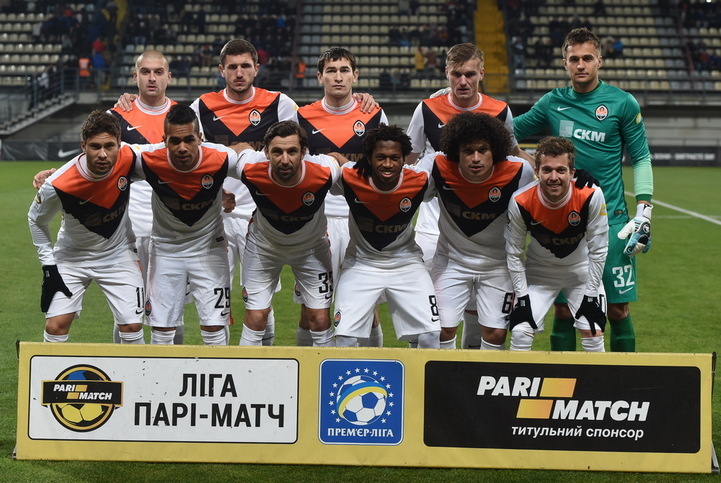 On October 30, Shakhtar faced Zorya in the Ukrainian league. Ukrainian League 2015-16. 13th round. October 30, 2015. Zaporizhzhya. Slavutych-Arena. 1C. The game took place in Zaporizhzhya, where Zorya entertain their opponents. Goalkeeper Anton Kanibolotskyy and defender Serhiy Kryvtsov, who took part in the Ternopil game, were fielded in the starting line-up. Darijo Srna played his 300th game as the team’s captain. Shakhtar got off to a flying start, with the Luhansk team relying on counterattacks. During the opening 15 minutes, the nominal hosts took two wide shots goal wards, and Bernard had his attempt on target but Zorya’s goalkeeper made a save. On 25 minutes, it was time for Kanibolotskyy to show his skill-set, when he denied Totovytskyy a chance after the latter bore down on goal and tried to send the ball under the roof of the net. Zorya’s attacks were getting more and more dangerous, and the Pitmen did not always succeed in creative game. But on 40 minutes, the Pitmen managed to organized an attacking move with a cross into the penalty area, which was followed by a Marlos pass to Fred whose shot took a deflection of the opposition defender and flew into the net – 0-1. Oleksandr Gladkyy also had a chance to score during a fast counterattack, but this time Zorya’s goalkeeper managed to catch the ball after a shot from the forward and deflection off defender’s foot. The first half ended with the Pitmen’s narrow lead. As soon as the second half started, the Pitmen doubled the lead: Taras Stepanenko headed in a Marlos cross from a corner to make it 0-2. On 53 minutes, Zorya could have pulled one goal back, but Kanibolotskyy made a brilliant save from close range. In the next episode, the Pitmen’s goalkeeper saved a Totovytskyy shot, and a little later he had to do his best to turn away a shot from a corner kick. Shakhtar responded to such activities from the hosts with a third goal: on 58 minutes, Azevedo made a cross for onrushing Alex Teixeira to easily send the ball in – 0-3 and the Brazilian’s 17th goal in 12 matches. Alex could have sealed a brace, but Levchenko coped with a curling shot from the league’s top scorer. On 67 minutes, the referee awarded a penalty kick against the Pitmen for handball. Kanibolotskyy guessed the direction of the shot right, but failed to make a save. The Pitmen quickly resorted parity: Levchenko made an error while rushing out goal outside the penalty area, Bernard tried to shoot, the ball bounced to Teixeira, who expertly sent the ball into the net to make it 1-4. On 75 minutes, Mircea Lucescu made double substitution, fielding Giorgi Arabidze and Eduardo. For a 17-year-old Georgian player, this match turned to be another debut game – this time in the league, and Eduardo scored with his first touch after receiving pass from Taison, who had come on as a sub, spending less than a minute on the pitch, - 1:5. Teixeira came close to sealing his hat trick, when advanced through the centre, but sent the ball wide. And Eduardo managed to seal his brace, seizing on the rebound in the closing stages of the game, - 1-6. Stepanenko wrapped up this entertaining game with a brilliant bicycle kick. Three Shakhtar players sealed their braces. Thus, having registered their biggest win in the season (7-1), Shakhtar cemented their place in the first spot of the table, claiming 31 points.